Prepared by Kerri Malatesta, AAVSO Technical Assistant. Symbiotic star system in the Southern Crab Nebula, located in the Southern Hemisphere constellation of Centaurus. Astronomers speculate that this dual hour-glass display is a result of two seperate outbursts that occured several thousand years apart. As the prototype symbiotic star, Z Andromedae is one of the most observed and well-studied stars of its class. This fascinating variable was discovered in 1901 by Williamina Fleming of Harvard College Observatory while investigating the observatory spectrum plates. The feature that caught Mrs. Fleming's attention was that Z And possessed a strange spectrum that resembled features found in Nova Persei 1901 (GK Per) and Nova Ophiuchi 1898 (RS Oph). As such, Z And was subsequently noted in her list of "stars with peculiar spectra." Further spectral analysis was carried out by Annie Jump Cannon when she isolated a group of red stars with H I and He II emission lines during her work on the HD Catalog, which included the star Z And. However, these findings went relatively unnoticed until 1932 when Paul Merrill and M.L. Humason rediscovered the stars CI Cyg, RW Hya, and AX Per as peculiar M-type stars with strong He II4686 emission lines. The spectra of these stars revealed the presence of a low temperature star coupled with emission lines typical of high excitation. In 1941, Merrill proposed the term symbiotic be used to describe stars exhibiting this combination spectrum, with Z And as the chief symbiotic. Symbiotic star system R Aquarii. This giant and white dwarf duo keep company with both a nebula and a jet. At present, there are about 150 variables classified as symbiotic. The class, however, consists of an inhomogeneous family of stars, with Z Andromedae, R Aquarii, and CH Cygni among the most noted members. About the only characteristic that really unites this species of variable is the fact they are all binary star systems. Spectra of symbiotic stars suggests that there are, in fact, three regions which emit radiation. The first component is a cooler region which is presumably a red giant or supergiant of K-M spectral class, where in some cases this member could be a Mira-type star (i.e., R Aqr). A second contributor produces bright emission lines similar to those emitted by a small, hot star. This secondary star could thus be "(1) similar to the central degenerate dwarf star of a planetary nebula, (2) a main-sequence star accreting from a disk, or (3) even an accreting neutron star..." (Iben and Tutukov 1996). The third component is believed to arise from a nebulosity that encompasses both stellar parties, and consists mainly of the matter lost by the cold giant star. Binary systems allow astronomers to determine some fundamental characteristics about the stars involved, such as mass and radii - parameters that are key in understanding stellar evolution. Symbiotic stars are special since not only do they supply information about stars that interact, but they also provide clues about processes in nebulae, interactions between the two stars in a binary system, and more. Symbiotics are among the binaries with the longest known periods (100-2000 days). Therefore, each component has time to live a good portion of its life before the symbiotic interaction is born. It is not clear whether these stars represent a homogeneous class of objects, or if they are stars of differing nature exhibiting similar behavior. In the detached binary system (top image), the stars are physically seperated. While with semidetached binary star system (bottom image), gas from one star is being drawn to its companion. According to Iben and Tutukov (1996) the symbiotic family can be divided into two classes as based on their observed physical properties. The first class is composed of detached systems containing a red giant or supergiant and a degenerate dwarf or neutron star. The second class is comprised of a semidetached system containing a red giant star and a main sequence accretor. In either case, the light curve can be seen to display bouts of long periods of quiescence, coupled with one or more nova-like outbursts followed by quasi-periodic oscillations. These stars tend to be concentrated in the galactic plane, with no real spacial preference and appear to belong to the old disk population (Mattei 1978). ZAND - symbiotic variables of Z Andromedae type. Close binaries consisting of a hot star, a star of a late spectral type and an extended envelope excited by the star's radiation. The combined brightness suffers irregular variations with an amplitude up to 4 V. A very inhomogeneous group of objects. Additional infomation about this class can be found in the August 2000 Variable Star of the Month, where the symbiotic CH Cygni is featured. By the late 1960s, astronomers had gathered a great deal of visual data for many of the stars of the symbiotic class and thus, work with these peculiar variables seemingly came to a standstill. However, with the deployment of astronomical satellites in the 1980s a resurgence of interest arose as astronomers began to probe these stars beyond the visual regime. In order to fully understand the processes of these stars, astronomers need to observe their behavior in many different wavelengths. Such investigation reveals information about the various components, as well as the evolutionary patterns of a given system. A short overview of the findings is presented here. However, the interested reader should refer to the paper by Mikolajewska (1992) and references therein for more information. X-ray (1-100 angstroms): Most of the symbiotics observed with X-ray satellites have not shown to be strong in this part of the electromagnetic spectrum. It is thought that such radiation is absorbed by the nebula. However, the far-UV and X-rays are most likely associated with a hot star that possibly has an accretion disk. Twelve strong emission lines of Z Andromedae identified by the IUE. Click on the above image for an enhanced view of the UV spectrum. Ultraviolet (380-13 nm): The International Ultraviolet Explorer (IUE) (in service from 1978 to 1996) has provided UV spectra showing very intense blue continua. Emission lines from highly ionized species confirm the presence of large ionized nebulae. Z And is one of the best monitored symbiotics in this portion of the spectrum. Infrared (730 nm to 1 mm): It is believed that the red and near-IR features are dominated by a cool star, while far-IR is believed to be the result thermal dust emission. Symbiotic stars are further divided into two categories as defined by their near-infrared properties: the S (stellar) type and the D (dusty) type. "The majority of the systems (~80%) belong to the S Class and have near-IR colors consistent with the stellar photospheric temperatures of 3000 K to 3500 K. A few other objects are the D-type systems and their near-IR colors indicate the presence of thermal radiation from hot (T ~ 1000 K) dust" (Mikolajewska 1992). Mikolajewska (1992) further states that "The division of symbiotics into S and D types is likely to hold a key to an overall understanding of the symbiotic phenomenon...At present, the distinction seems to be one of orbital separation: whether the cool star has been permitted to evolve to a Mira state with substantial wind and dust production." Radio (3 kHz to 300 GHz): Symbiotic emission of this variety is associated with the amount of dust in the stellar envelope. Therefore, it is not surprising that the D-type stars display large fluxes in the radio portion of the spectrum. Although Z And was not discovered until 1901, photographic plates have provided astronomers with data which predates its discovery. As such, Z And's activity has been tracked from 1887 to 1922 through data extracted from this process. AAVSO observers have since monitored this stars' erratic and unpredictable behavior in the visual portion of the electromagnetic spectrum since 1917. Click on the above image to view the long-term light curve of Z And. Spectral and photometric characteristics of Z And during quiescence reveal a small amplitude semi-regular red variable with an M-type spectrum and an average magnitude of about 11. Every 10 to 20 years, however, the star undergoes a sudden period of great activity in which the brightness increases by 3 magnitudes. In the past century of monitoring, Z And has been observed to go through several such outbursts in 1900, 1915, 1939, 1959, and 1967/1968. The large amplitude outbursts are then followed by smaller outbursts of decreasing amplitude, afterwhich it fades to quiescent magnitude. (The light curve can be likened to a plot of a damped oscillator.) The brighter state occurs either abruptly or is preceded by a smaller outburst. Based on the AAVSO International Database, the brightest recorded magnitude was achived during the 1939 outburst whereby the star reached a maximum mean visual magnitude of 7.9. During outburst, the stars' B-V color decreases (the star gets bluer) and the spectrum is dominated by the hot, compact star with a B-type shell spectrum. P Cygni features arise displaying blueshifted absorption lines, indicating an expanding shell as seen in novae. As the shell dominated spectrum slowly fades, the B-V color increases (the star get redder), the P Cygni features disappear, the shell spectrum weakens and disappears, and the system returns to its slow and semi-regular variations. Its lines almost disappear at minimum, and the titanium oxide bands from the red star become prominent. The intervals between maxima range from 310 to 790 days (Mattei 1978). Top: A red giant star and a white dwarf star in orbit about each other. Bottom: The red giant loses its outer layers in a stellar wind, which is in part accreted in a disk formed around the dwarf star. As is the case with all symbiotic stars, Z And is not a single star, but rather is a binary system. The components involved entail a hot, compact dwarf star and a cool red giant star in orbit about each other, with both components engulfed in nebulosity. In the Z And system, the dwarf component appears to accrete mass from a wind emanating from the red giant component. Since it seems to be a detached system, stellar wind may be a key component during both quiescence and outburst. The accreted matter may then form a disk around the white dwarf component, however the existence of a disk has not been confirmed. The outbursts are thought to derivate from the blue star, but the red star appears to be variable as well. An interesting fact is that both stars seem to vary in nearly the same cycle, each with a period of about 700 days. However, it is concluded that some of the properties of Z And's variability are due to the binary model. Many of the basic stellar parameter such as stellar mass, and inclination of the system are unknown and prevent further knowledge and theoretical models of the system (Viotti and Hack 1993). Z And can be found amongst three bright comparison stars. With its location in the constellation of Andomeda, Z And is in prime northerly position as the Northern Hemisphere slides into the fall season. The variable is located about 5 degrees southwest of R Cassiopeiae, and along a line that extends north through kappa and lambda Andromedae. The new observer will find the Andromeda finder chart helpful in identifying the variable's residence within the constellation. Although this star fluctuates between a magnitude of about 8 to 11 on a somewhat irregular basis, observers can presently catch a glimpse of this prototype flirting with the brighter end of its range. It seems that Z And has conveniently orchestrated its viewing in the night sky with a recent outburst - the first since 1997! Observers with moderate-sized telescopes should find this star an easy target at either extreme of its range, and are encouraged to observe it in its current state. Interested parties should plan to observe Z And about once a week. We also encourage our CCD observers to carry out multi-color (B and V) observations throughout this (or any) active phase. During Z And's outbursts, the B-V color decreases (i.e., the system gets bluer) and it would be informative to correlate this color change with the optical light curve. When reporting variable star observations to the AAVSO please be sure to identify the comparison stars and chart(s) used. We strongly encourage observers to use our new utility which allows online submission of observations. Daily updates of Z And's activity can be found by visiting our Quick Look file. For more information about the current outburst, see News Flash #668 and an update in News Flash #670 (September 6 and 11, 2000, respectively). *Note: We have recently released new versions of the charts for Z And. Both the new and experienced observer should download the new charts and incorporate them into their chart files. As is the case with many types of variables, more work needs to be done before astronomers can more thouroughly explain with certainty the nature and behavior of these symbiotic systems. Correlation between visual and multiwavelength data will surely aid in this search. However, such studies should be carried out long enough to cover all phases of symbiotic activity. Unfortunately with such long periods, studies as such are presently not realistic. 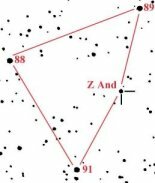 The late Margaret Mayall, former director of the AAVSO, once said: "Z Andromedae is another variable that shows it will require several hundred years of observations before a good analysis can be made of its variations." With the help of AAVSO observers, hopefully future generations of observers will see this prediction come true! Fernandez-Castro, T. et al. "The Active Phase of the Hot Component of Z Andromedae." The Astrophysical Journal, 442, 1995, 366-380. Formiggini, L., and E.M. Leibowitz. "Three Periodicities in a 98-Year Light Curve of the Symbiotic Star Z Andromedae." Astronomy and Astrophysics, 292, 1994, 534-542. Friedjung, Michael, and Roberto Viotti, eds. The Nature of Symbiotic Stars. Holland: D. Reidel, 1982. ISBN 90-277-1422-3. Iben, Icko Jr., and A.V. Tutukov "On the Evolution of Symbiotic Stars and other Binaries with Accreting Degenerate Dwarfs." The Astrophysical Journal Supplement Series, 105, 1996, 145-180. Kenyon, Scott J., and Ronald F. Webbink. "The Nature of Symbiotic Stars." The Astrophysical Journal, 279, 1984, 252-283. Mattei, Janet A. "Variable Star Notes." Journal of the Royal Astronomical Society of Canada, 72, 1978, 61-64. Mikolajewska, Joanna. "Symbiotic Variable Stars." In Percy, Mattei, and Sterken, eds., Variable Star Research: An International Perspective. New York: Cambridge UP, 1992, 55-59. ISBN 0-521-40469-X. Nussbaumer, H., and M. Vogel. "Z Andromedae and the Symbiotic Phenomenon." Astronomy and Astrophysics, 213, 1989, 137-147. Torbett, Michael V., and Bel Campbell. "Radio Emission from Symbiotic Variables: CI Cygni, Z Andromedae, and EG Andromedae-Temporal Variability as Clues to the Nature of Symbiotics." The Astrophysical Journal, 340, 1989, L73-L76.